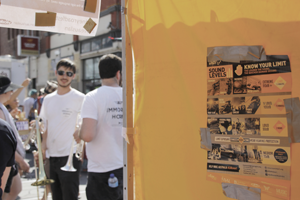 In March 2016, HEARsmart joined forces with Vic Deaf and had a spot at the Brunswick Music Festival – Sydney Road Street Party. The hot weather over the weekend was a perfect match for the fiesta that delivered fantastic local music, dance and food, all jam-packed along an 800 meter stretch of Melbourne’s vibrant inner north. Armed with free foam- and filtered-ear plugs, the HEARsmart team chatted to interested festival goers about their hearing and options for protecting it. “It was great to be at the street party and meet people who were really engaged with music” said Dr Jane Sewell, co-manager of HEARsmart, “a lot of people recognised their hearing wasn’t as good as it used to be and were worried about what that meant for their long term hearing health – they just weren’t sure what they should do next, and we could help them with that”. 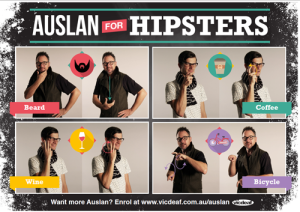 auslan training and services – see right for their great downloadable poster ‘Auslan for Hipsters’. See you next year Sydney Road! Download your copy by clicking on the image below.